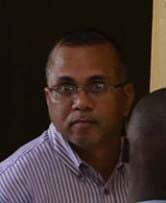 Frederick Flatts, former senior civil engineer in the Agriculture Sector Development Unit of the Ministry of Agriculture, on Tuesday testified that he never received payment certificates from Hanniel Madramootoo for works that were done on the Guyana Marketing Corporation (GMC) building. Flatts made this disclosure during the trial of former GMC General Manager Nizam Hassan and Felicia Madramootoo, the wife of Hanniel, who are accused of conspiring with Hanniel and others to approve payments to Constantine Engineering and Construction Services, although the works were “incompetently and incorrectly” done. Also charged are Hanniel’s brother, Philp Madramootoo, and his friend Nizam Ramkissoon, both Directors of Constantine Engineering and Construction Services Limited, of Trinidad and Tobago. 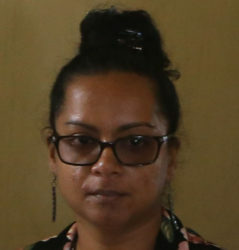 The charge states that Hanniel, who was the Project Engineer within the Ministry of Agriculture, conspired to commit a misdemeanour of procuring money to be paid by false pretence with intent to defraud, together with the others between October 28, 2010 and April 25, 2012, by continuously approving payments which were made to Constantine Engineering and Construction Services Limited for works that were “incompetently and incorrectly” done with inferior materials to rehabilitate the GMC building at Robb and Alexander streets, Bourda, fully knowing that such works should not have been approved for payments. Flatts, who is now the Chief Executive Officer of the National Drainage an Irrigation Authority, was employed in 2010 as the Senior Civil Engineer. He told Chief Magistrate Ann McLennan, who is hearing the trial, that while employed as the civil engineer he was the immediate supervisor for Hanniel, while the director of the unit was Dr. Elizabeth Ramlal. The court heard that when there was a civil engineering project to be executed by one of the departments of the ministry, then the head of the department would inform Dr Ramlal, who would then ask Flatts to assign an engineer to the project. That engineer, he continued, would be responsible for the designs, formatting the tender documents, and for the contract management after the award by the tender board. Flatts further stated that the contract management entailed signing on the start date, visiting the site on a regular basis to ensure that the works were being carried out according to contract drawings and specifications, and preparing interim valuations certificates. The engineer, Flatts noted, was required to recommend payment to him [Flatts], so that he could recommend to the relevant head of department. Flatts added that his recommendation would be accompanied by his signature. When asked by the prosecutor if he recalled recommending Hanniel to the project at GMC, Flatts stated that he did recall making the recommendation. He added that Hanniel would have done the design on GMC, prepared the tender documents and in the supervision phase prepared the interim documents. Flatts, noted, however, that no payment certificates were brought to him for approval and recommendation by Hanniel. He stated that the payments were submitted directly to the GMC’s department head, Hassan. Subsequent to Flatts’ evidence-in-chief, he was subjected to cross-examination by attorney Glenn Hanoman, who represents Felicia. It was under cross-examination that Flatts stated that payments are made at interims for works that would have been satisfactorily done. Flatts, however, noted that the contract between GMC and Constantine Engineering was terminated close to the end and that he was unaware of any of the work being satisfactorily completed. At the end of Hanoman’s cross-examination of Flatts, Hassan’s attorney also asked questions. Later, Permanent Secretary in the Ministry of Agriculture George Jervis testified on behalf of the prosecution. He too was subjected to cross-examination by the defendants’ attorneys. The matter was then adjourned. There are a total of seven witnesses remaining in the matter.